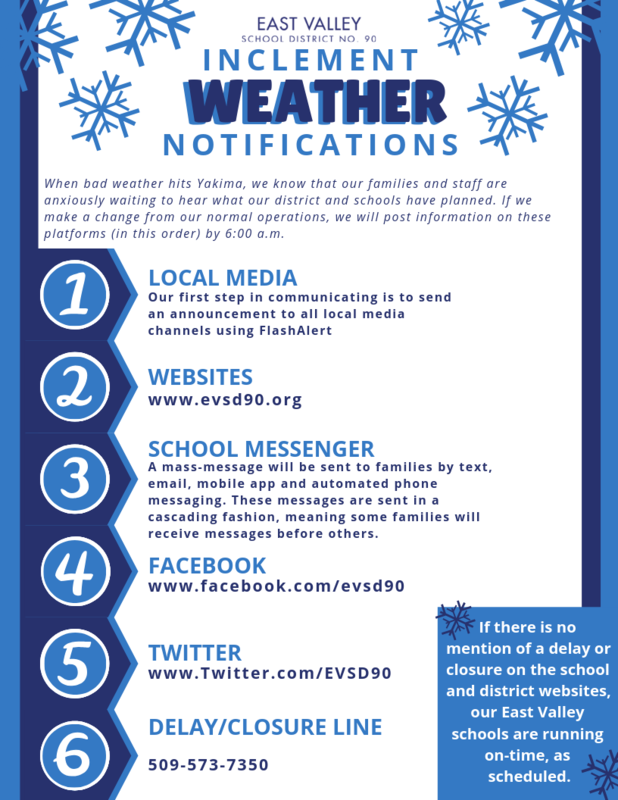 Wintery weather can mean changes to the regular operations of our district and schools. We thank you, in advance, for your patience during times of inclement weather. Buses may be delayed returning students home. Our buses are prepared for snowy conditions and our drivers are well-trained to transport students in snowy conditions. Making sure that students return home safely is our top priority. The district doesn't send students home early because it is snowing. Many of our families do not have an adult who can be home early to provide supervision for their child(ren) on short notice. Afternoon and evening activities may be cancelled. The decision whether to cancel after-school activities will be made as early in the afternoon as possible. School delays and cancellations - Road conditions in the district can vary depending on where you live. Our district makes the decision to delay or cancel school based on if we believe our buses can safely transport children. If school is delayed or cancelled due to inclement weather, every effort is made to make the decision before 6:00 a.m. If conditions change after the decision is made to delay school, it is possible that the district may cancel school. In this event, we will try to make a final decision by 7:30 a.m., or shortly thereafter. If a decision is changed, an updated alert will be sent out as soon as possible. We support a parent or guardian's decision to pick up their child(ren) early from school or to not send them to school due to inclement weather. Absences will be considered excused with a signed note. Please remember that research shows that students who miss fewer than 2 days each month are more likely to demonstrate academic success. allow for extra time to get where you need to go. dress children in warm coats, boots, hats and gloves. be prepared for delays and closures and have a care plan in place for children, should you need to report to your employment. 1. Why don't we make our decisions and announcements the night before? We simply don't know what our decision will be until the morning of. Weather forecasts/weather conditions can change, as can the roads. In the past when we have announced delays the night prior and then had to change to cancellation, we had confusion and frustrated families that had to, once again, change their plans. We have found that it is best to make our decisions and announcements when we have the most accurate information available. 2. Why do we have school when other local schools don't? We don't make our decisions based on what other districts are doing; we base them on the conditions in our district, on our roads. We wake up and begin driving roads at 3:30 in the morning. We assess road conditions to determine whether our buses can safely transport students to and from school. Once we are ready to make our decisions related to transportation and school operation, we try to send a notification out to the news media and our families no later than 6:00 AM. If weather conditions change significantly and our delay turns into a closure, we will try to send an update to our community by 7:30 a.m.
3. Will we have to make up our snow days? As soon as we can be sure that additional winter storms will not initiate further school closures, we will review our academic calendar and communicate potential changes to our families. To download, click on the files below.